On this page you can learn more about the ADO.Net Data Access Components(DAC) for Delphi. For more information about the product you are interested in, click on the learn more button or navigate to one of its information pages. ADO.Net DAC for Delphi is the fastest and most reliable database connectivity solutions for any database using ADO.Net technology in Delphi. It provides data access to data sources such as SQL Server, Oracle, SQLite, VistaDB and to data sources exposed through OLE DB and ODBC using ADO.Net data provider framework. ADO.Net DAC for Delphi is an enterprise solution with highest performance and unlimited possibilities. 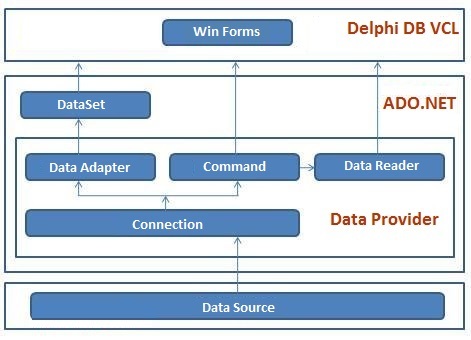 Data-sharing consumer applications can use ADO.NET DAC for Delphi to connect to these data sources and retrieve, handle, and update the data that they contain. With its powerful common architecture base on ADO.Net technology, ADO.Net DAC for Delphi enables high-speed direct data access from Delphi to SQL Server, Oracle, SQLite, VistaDB and other data sources exposed through OLE DB and ODBC. ADO.Net DAC for Delphi provides a library of components for connecting to a database, executing commands, and retrieving results. Those results are either processed directly, placed in a Virtual Table components. The Virtual Table component can also be used independently of any active connection to manage data local to the application or sourced from XML. You have the choice of either using client-side or server-side cursors. The ADO.Net DAC for Delphi actually handle the work of cursors. The developer has the freedom of choice in development, for creating efficient applications. Our product supports the latest versions of the popular database servers like Oracle, SQL Server, SQLite, VistaDB and other data sources (using ODBC and OLE DB providers) such as MySQL, InterBase, Firebird, PostgreSQL etc. Lets you set up and control connections to SQL Server database. Executes a Transact-SQL statement or stored procedure against a SQL Server database. Provides a way of reading a forward-only stream of rows from a SQL Server database. Lets you fill Virtual Table components with data and update a SQL Server database. Lets you efficiently bulk load a SQL Server table with data from another source. Uses SQL statements to retrieve data from tables in a SQL Server database and pass it to one or more data-aware components through a TDataSource object. Lets you retrieve and update data in a single table in a SQL Server database without writing SQL statements. Executes stored procedures and functions in a SQL Server database. Lets you edit cursor data returned as parameter. Lets you set up and control connections to Oracle database. Executes a Transact-SQL statement or stored procedure against an Oracle database. Provides a way of reading a forward-only stream of rows from an Oracle database. Lets you fill Virtual Table components with data and update an Oracle database. Uses SQL statements to retrieve data from tables in an Oracle database and pass it to one or more data-aware components through a TDataSource object. Lets you retrieve and update data in a single table in an Oracle database without writing SQL statements. Executes stored procedures and functions in an Oracle database. Lets you edit cursor data returned as parameter. Lets you set up and control connections to SQLite database. Executes a Transact-SQL statement or stored procedure against a SQLite database. Provides a way of reading a forward-only stream of rows from a SQLite database. Lets you fill Virtual Table components with data and update a SQLite database. Uses SQL statements to retrieve data from tables in a SQLite database and pass it to one or more data-aware components through a TDataSource object. Lets you retrieve and update data in a single table in a SQLite database without writing SQL statements. Lets you set up and control connections to a data source through ODBC drivers. Executes a Transact-SQL statement or stored procedure against a data source. Provides a way of reading a forward-only stream of rows from a data source. Lets you fill Virtual Table components with data and update a data source. Uses SQL statements to retrieve data from tables in a data source and pass it to one or more data-aware components through a TDataSource object. Lets you retrieve and update data in a single table in a data source without writing SQL statements. Executes stored procedures and functions in a data source. Lets you edit cursor data returned as parameter. Lets you set up and control connections to a data source through OLE DB provider. Lets you fill Virtual Tables components with data and update a data source. Lets you set up and control connections to VistaDB database. Executes a Transact-SQL statement or stored procedure against an VistaDB database. Provides a way of reading a forward-only stream of rows from an VistaDB database. Lets you fill Virtual Table components with data and update an VistaDB database. Uses SQL statements to retrieve data from tables in an VistaDB database and pass it to one or more data-aware components through a TDataSource object. Lets you retrieve and update data in a single table in an VistaDB database without writing SQL statements. Executes stored procedures and functions in an VistaDB database. Lets you edit cursor data returned as parameter. Use TClrMemTable to manage data in the client memory and optionally exchange the data with a data source. It offers a disconnected data source architecture which means there is no need of active connections during work with this component. Represent an in-memory cache of data retrieved from a data source. It offers a disconnected data source architecture which means there is no need of active connections during work with this component. Displays data in a customizable grid. Encapsulates the data source for a VCL form. Represents the navigation and manipulation user interface (UI) for controls on a form that are bound to data. Full support of the latest server versions. Compatible with Code Gear RAD Studio 2009, Embarcadero RAD Studio 2010, XE, XE2, XE3, XE4, XE5, XE6, XE7, XE8, Seattle, Berlin, Tokyo, Rio. Support for all standard and third-party visual data-aware controls. High performance access to the data source. Fast controlled fetch of large data blocks. High performance of applying cached updates with batches controlled by UpdateOptions.UpdateBatchSize property. Fast locate in a sorted DataSet. Intelligent fetch block size control. Rowset fetching support using TDbRecordSet Class which mimics the behaviour of ADO RecordSet Object using ADO.Net technology. ADO.NET DAC components uses XML to store and transfer data among applications, which provide fast access of data for desktop and distributed applications. Added VistaDB Data Access Components. Added data and grid components. The product is no longer FREE. Prefetching rows - specifies the number of rows that are to be fetched per server round trip. The following code listings demonstrate how to retrieve data from a database using TDbDataReader descendants component. The code in this example assumes that you can connect to the Northwind sample database on Microsoft SQL Server. The code creates a TSqlClientDataReader to select rows from the Products table, adding a parameter to restrict the results to rows with a UnitPrice greater than the specified parameter value, in this case 5. The code executes the command using the TSqlClientDataReader, and displays the results in the console window. // Provide the query string with a parameter placeholder. // Specify the parameter value. // Create and open the connection. // Create the DataReader command. The code in this example assumes a connection to DEMO.CUSTOMER on an Oracle server. The code executes the command using the TOracleClientDataReader, and displays the results in the console window. The code in this example assumes a connection to SQLite Northwind data file. The code executes the command using the TSQLiteDataReader, and displays the results in the console window. The code in this example assumes that you can connect to the Microsoft Access Northwind sample database. The code creates a TOdbcDataReader to select rows from the Products table, set the parameter to restrict the results to rows with a UnitPrice greater than the specified parameter value, in this case 5. The code executes the command by using a TOdbcDataReader, and displays the results in the console window. The code in this example assumes that you can connect to the Microsoft Access Northwind sample database. The code creates a TOleDbDataReader to select rows from the Products table, set the parameter to restrict the results to rows with a UnitPrice greater than the specified parameter value, in this case 5. The code executes the command by using a TOleDbDataReader, and displays the results in the console window. The code in this example creates TClrMemTable, add field Definitions to the TClrMemTable object, open the dataset and insert data into the dataset and displays the results in the console window. // Here we add five Records. To access the full source code examples, kindly download the Compiled demo zip file from the Download Page.